Snowboarding growth is plagued with a problem that boarders take for granted: The sport requires one’s feet to be bound to the board in a particular orientation. That orientation may be optimal for a particular hill or terrain, but may need to be adjusted for other conditions, requiring the rider to unbolt the bindings from the board for any change. Fatigue resulting from non-optimal foot positioning over most runs and board orientations is common. Broko Bindings eliminate this restriction. Broko Bindings let your feet naturally assume the best stance regardless of terrain or board orientation. Subtle, dynamic adjustments makes your stance more natural, reduces fatigue and injuries, produces a faster learning curve and allows for more aggressive tricks and freestyle maneuvers than the standard rigid design. Broko Bindings allow the board to follow the changes in the terrain, while your stance naturally follows the board, allowing you to move faster and more fluidly. You lose no control. When you need the board to respond, it does, just as it does with traditional bindings. 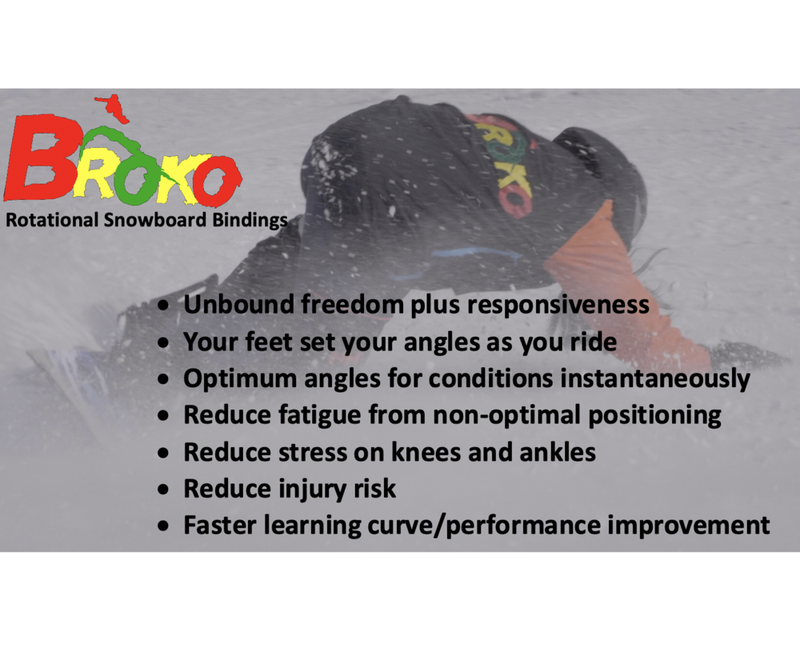 With Broko Bindings, you get the best of both worlds - freedom and responsiveness. During jumps, while in the air, the foot naturally positions itself in the most beneficial position for landing (within the constraints of a snowboard in general, of course), just as you do when jumping from a wall or when running and jumping. Second, upon impact, the foot further rotates to absorb the impact and minimize stress on the knee and ankle. The two motions described leave the foot, ankle and knee in the best position to continue riding after landing, increasing the probability of a successful landing, improving overall enjoyment, and reducing risk of injury from a less-than-optimal landing. David is a Physics major, with a strong penchant for mechanical engineering. When the snow melts, David is an avid rock climber who has led competitive teams to five consecutive first place seasons. He also loves most board sports. In the summer he can be found surfing on Maui's North Shore, and hiking the Iao Valley Rainforest. He drives a Jeep Wrangler that occasionally, though rarely, has the doors attached. Brokos relive stress from ankles, knees and hips, and reduce muscle fatigue while riding. In lift lines, your foot can face forward or in any orientation you want, and on the lifts, your foot and board can remain vertical and relaxed. Proper orientation of the feet as you ride reduces the risk of falls, and the ability of the feet to move during inevitable falls reduces (but does not eliminate) the risk of injury. 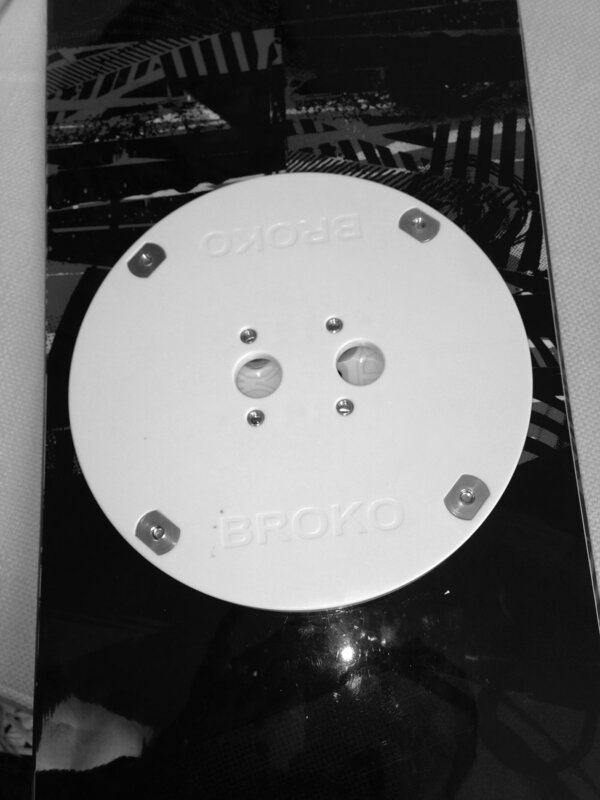 This paper addresses ACL and other injury concerns while snowboarding with and without Brokos. Will Broko Bindings fit my Board? Broko Bindings fit all 3-hole, 4-hole and Burton Channel boards easily. All disc-mount boot bindings will fit the Broko Binding using a standard 4-hole compatible disc. 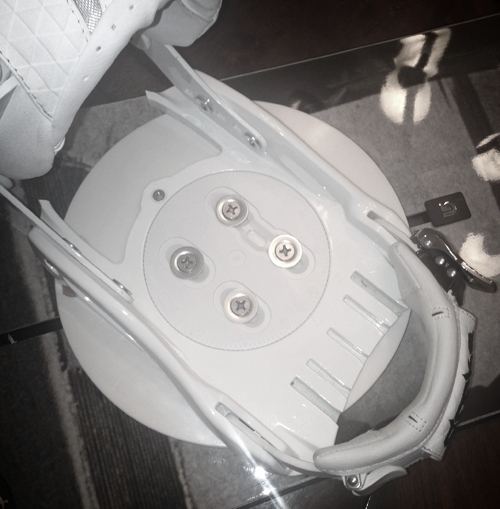 Installation is as simple as attaching the bindings to the board using standard snowboard screws and washers, then attaching the boot bindings to the Broko Bindings using 4 screws and washers. There is no need to worry about what angle or position to set your bindings, and you don't need to decide if you want to ride regular or goofy - that is all done later, as you ride.